Decoder chrashed, used only audio mixer, no radio control. Hello and sorry for the delay in response. I never see a behaviour like that before. The software seems to be crashed at first packet reception. 1) Have you tried some previous release of RS41T or you have start to test with version 1.2? 2) Have you saved your settings? If so, is it possible to have a copy of the RS41Tracker.ini file using private message o email ? 3) Is it possible your PC moves in standby mode? 4) Could you kindly perform ad additional test to verify if the crash occurs anymore? P.s. If I'm not wrong you are running two instance of the Rs41 tracker (This is not the problem in my opinion). V 1.0, 1.2, 1,3 "06/01/1980" IS NOT A VALID DATE. The problem is due to and unexpected character in your date format. Teorically the RS41T is able to use the standard char "/" between days,months, years value. Probably your format or customization doesn't works well with this conversion. Could you please report your regional customization settings for your operating system? Hereafter I report mine (italian). I found the problem location. A new feature introduced in the latest releases perform a wrong GPS timer initialization (like the first version did). This version will be available for download before midnight. Thanks all for the problem reports. Hereafter the changelog respect to the previous version. * Shortcut for google-maps in browser. This command show the radiosonde latest position using google map on your favorite browser. * Radiosonde track can be saved in kml format (and loaded in google earth software for 3D evaluations). * Support to kml ghost-track. Software is able to load a GPS track file in kml format. Of course any "well formatted" kml file can be loaded. * Frequency reported in Radio I/F box was wrongly cleared once new SondeId was found. Software updates check (at startup and on demand). The software now it's able to verify if a new software version is available. Automatic check at startup can be enabled/disabled into settings section. Manual check can be performed using the "check for update" button located in "About" window. Detection of ozone sensor unit. Software is now able to detect if an ozone sensor unit is connected to Rs41 radiosonde. Information is reported in signal processing section of the main window and it's reported as "Ozone". When "Led" il blinking the ozone sensor is present. All information related to the ozone sensor telemetries (if present) are now reported. Maximum altitude received form a radiosonde is now reported in status bar. In case of good signal received (no data loss) this value is is the baloon burst altitude. Due to lack of information related to PTUs, these parameters have to be considered as an estimation. Please see "Telemetries accuracy" chapter of user manual. Precise pressure calculation for Rs41-SGP model. A new algo was introduced to calculate the pressure for the SGP model. 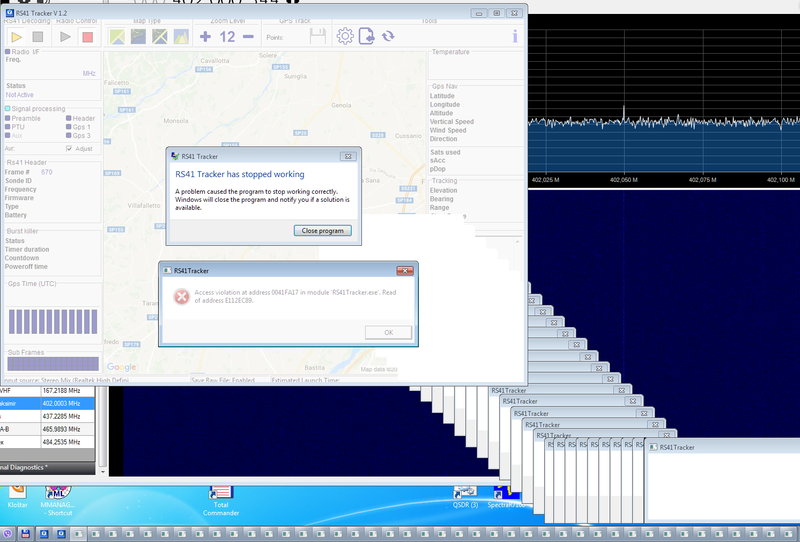 Software can handle an AZ/EL antenna rotor in order to track Rs41 Radiosonde. - manual set of Az/El Values. A control panel is added in order to regulate the processing speed of the RAW file. Following speeds are introduced: Max, 8x, 4x, 1x, 0.5x, Stop. Speed Labels can be clicked in order to quick set the related value. File processing can be terminated pressing the related button in control panel. Maximum wind speed received from a radiosonde is now reported in status bar. This value is referenced with related altitude and wind direction. Software stuck when received preamble data is located in a particular data buffer location. Due to the fact I don't own an Antenna rotor I'm trying to create one using a 3D printer. Project requirements were:portability, lightweight, wireless connection (Bluetooth), 12V power supply. The first working prototype was used to develop the rotor handler software and it's currently used in my radiosonde tracking. Once completed I will provide documentations on Radiosonde site. A short demonstration video can be found here. That's all. Sorry for the long post. Im using your decoder for RS41 all the time, works fine but last week it had problems with "loading maps"
today it cant load any map, so google stopped that option you use in it. I want to ask you long time ago, what with maps when you are on field tracking and no internet connection? Must add some option with calibrated pictures as maps if that is possible. sorry for the delay in response but I missed your post. Unfortunately problems with map downloading are due to google maps servers. They change the maps usage policy .. basically google maps are no more free to use for softwares and websites. So they are playing with deny of service when a map request occurs (sometimes works.. others not). Calibrated pictures could be a solution but in this period I worked on a different approach more simple for users. I created a brand new map engine based on OpenStreetMap instead of Google Maps. The engine is able to locally save maps so once you have downloaded a map you can use it without internet access. respect to the previous version you can also drag maps using mouse. Autocenter function is also present (like previous version). New map engine is very complex (from software programming point of view) and probably is not "bug free" but for sure it 's free from Google Maps problems. New release is available from today at the following address. - bidirectional connection to APRS server (it's now possibile to send radiosonde position to APRS but it''s also possibile to see on map and track positions of all available radiosonde on APRS). - wrong reporting of o3 pump temperatures when negative values occurs. Stranica je generirana za 0.272 sekundi uz 23 upita.